LAFAYETTE, Colo. - Northeast Academy's Stephen Lewis has been appointed head coach of the AIG Men's Collegiate All-Americans Sevens team, effective immediately. The principally under-23 National Team in the Olympic sport of Rugby Sevens returns to the field of play next month at Rugbytown 7s in Glendale, Colo., a competition the MCAAs have won as recently as 2013. Lewis joins the program having worked with several National Teams and interacting with young student-athletes in the Northeast region and around the country. "Steve has a proven capacity to identify rugby talent and help those athletes evolve into the senior national teams with limited assembly times," USA Rugby National Teams & Performance General Manager Alex Magleby said. "It is also an opportunity for both coaches to continue to be challenged and progress on the coaching ladder." 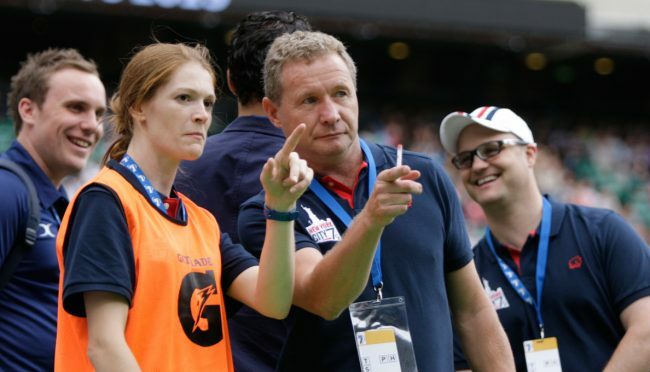 Lewis was named 2014 Senior Club Coach of the Year following Old Blue's men's team's runner-up campaign at the 2014 USA Rugby Emirates Airline Club 7s National Championship. He is also a founding member of Northeast Academy, a top-performing USA Rugby National Development Academy that has raised the level of young athletes from the college and club ranks to Eagle selections across both genders. The Scotland native is a certified World Rugby Level 3 coach and served as the director of rugby for PRO Rugby's inaugural 2016 season. As head coach of the MCAA Sevens team, Lewis will be tasked with identifying young talent as well as coaching players in competition. Lindenwood University Head Coach Josh Macy has been hired as assistant coach for the MCAA Sevens, with both volunteer staff members expected to work closely with AIG Men's Collegiate All-Americans XVs staff and additional National Team coaches to assist in the evolution of High Performance Player Pathways.